Explore the wide variety at Arrowhead Cabinets, a dealer of both kitchen cabinets and bathroom cabinets in Glendale, Arizona. We specialize in customer service and always try to make sure you get what exactly what you are looking for. Contact us to learn more about our Home Office Cabinets, Bookcase Walls, and Entertainment Centers in our cabinet showroom. Organize your kitchen with cabinets from Arrowhead Cabinets. As a dealer of fine kitchen cabinets, we carry cabinets in all price ranges and all styles, including a wide range of colors and door types. 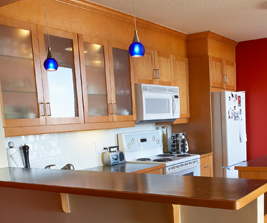 From full custom to semi-custom kitchen cabinets, we can meet your every need. You can make your Bathrooms the best rooms with our wide range of bathroom cabinets, available at great prices. These are all genuine wood face frame bathroom cabinets that come in many different styles to choose from. We have both raised-panel and flat-panel cabinets available, so contact us to see what we have to offer. Contact us at (877) 230-9343 in Glendale, Arizona, to learn more about our selection of kitchen and bathroom cabinets.